Terrasses de la Chaudière houses the departmental headquarters in Gatineau, Quebec. The Department of Indian Affairs and Northern Development (DIAND), referred to by its applied title under the Federal Identity Program as Indigenous and Northern Affairs Canada (INAC), (French: Affaires autochtones et du Nord Canada, AANC), is the department of the government of Canada with responsibility for policies relating to Aboriginal peoples in Canada, that comprise the First Nations, Inuit, and Métis. The department is overseen by two cabinet ministers, the Minister of Crown–Indigenous Relations (whose portfolio includes treaty rights and land negotiations) and the Minister of Indigenous Services (whose portfolio includes health care, water, and other services to Indigenous communities). 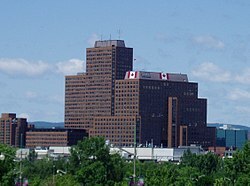 Its headquarters are in Terrasses de la Chaudière, in downtown Gatineau, Quebec. In August 2017, Justin Trudeau announced the dissolution of Indigenous and Northern Affairs Canada and announced that it will be replaced by Indigenous Services Canada and Crown-Indigenous Relations and Northern Affairs Canada. Pursuant to the Department of Indian Affairs and Northern Development Act the term "Indian" remains in the department's legal name, although the term "Indigenous" is used in its applied title under the Federal Identity Program. First Nation, has been used since the 1970s instead of the word "Indian", which some people found offensive. The term "Indian" is used for legal and historical documents such as Status Indians as defined by the Indian Act. For example, the term "Indian" continues to be used in the historical and legal document, the Canadian Constitution and federal statutes. Aboriginal Affairs and Northern Development Canada used the term Inuit in referring to "an Aboriginal people in Northern Canada, who live in Nunavut, Northwest Territories, Northern Quebec and Northern Labrador. The word means "people" in the Inuit language — Inuktitut. The singular of Inuit is Inuk." Eskimo is found in historical documents about Canadian Inuit. The term "Aboriginal" is commonly used when referring to the three groups of indigenous peoples as a whole. It is also used by Aboriginal people who live within Canada who claim rights of sovereignty or Aboriginal title to lands. Indigenous and Northern Affairs Canada (INAC) is one of the federal government departments responsible for meeting the Government of Canada's obligations and commitments to First Nations, Inuit and Métis, and for fulfilling the federal government's constitutional responsibilities in the North. INAC's responsibilities are largely determined by numerous statutes, negotiated agreements and relevant legal decisions. Most of the Department's programs, representing a majority of its spending - are delivered through partnerships with Aboriginal communities and federal-provincial or federal-territorial agreements. INAC also works with urban Indigenous people, Métis and Non-Status Indians (many of whom live in rural areas). participate more fully in Canada's political, social and economic development to the benefit of all Canadians. INAC also works with urban First Nations, Métis and Non-Status Indians (many of whom live in rural areas) through the Office of the Federal Interlocutor. INAC also manages the resources and lands of federal lands, including land and subsurface leases and resource royalties. In 1755, the British Crown established the British Indian Department. The Indian Governors General held control of Indian Affairs, but usually delegated much of their responsibility to a series of Civil Secretaries. In 1860, the responsibility for Indian affairs was transferred from the government of Great Britain to the Province of Canada and the responsibility for Indian Affairs was given to the Crown Lands Department Commissions Responsible for Indian Affairs. The federal government's legislative responsibilities for Indians and Inuit derive from section 91(24) of the Constitution Act, 1867 and responsibility was given to the Secretary of State for the Provinces Responsible for Indian Affairs. In 1876, the Indian Act, which remains the major expression of federal jurisdiction in this area, was passed and a series of treaties were concluded between Canada and the various Indian bands across the country. The responsibility for Indian Affairs and Northern Development rested with various government departments between 1873 and 1966. The Minister of the Interior also held the position of Superintendent-General of Indian Affairs after the Indian Affairs Department was established in 1880. In 1939, federal jurisdiction for Indian peoples was interpreted by the courts to apply to the Inuit. A revised Indian Act was passed in 1951. From 1950 to 1965, the Indian Affairs portfolio was carried by the Minister of Citizenship and Immigration. On October 1, 1966, the Department of Indian Affairs and Northern Development was created as a result of the Government Organization Act, 1966. Effective June 13, 2011, the department began using the applied title Aboriginal Affairs and Northern Development Canada in addition to the legal name of the department. The Northern Development part of the department has its origins in the Department of the Interior, a body created by then Prime Minister John A. Macdonald for the purpose of administering the Dominion Lands Act of 1872. When the Department of the Interior dissolved in 1936 (with the Natural Resources Acts transferring control over natural resources to the Prairie provinces), Indian Affairs fell under the purview of the Department of Mines and Resources. However, the need for social and health-care services in the North led to the establishment of the Northern Administration and Lands branch in 1951, which led to the creation of the Department of Northern Affairs and National Resources in 1953. This became the Department of Indian Affairs and Northern Development in 1966. Under the Federal Identity Program, the department is known as Indigenous and Northern Affairs Canada. Beginning in the early 20th century, the Canadian government sponsored annual expeditions to the Canadian North. These expeditions yielded extensive photographic documentation of the lives of northern indigenous peoples by participating explorers, engineers, scientists and medical staff. Explorer, photographer, filmmaker, writer and lecturer Richard S. Finnie accompanied numerous expeditions to the North. His first voyage was aboard CGS Arctic, under the command of Captain Bernier in 1924. During the 1930–1931 expedition to the Western Arctic, Finnie served as filmmaker. Lachlan T. Burwash, an exploratory engineer with the Department of the Interior, made a survey of the east coasts of Hudson Bay and James Bay, and the Belcher Islands in the late 1920s. Zoologist Joseph Dewey Soper travelled to the Baffin Island (Qikiqtaaluk) region in the late 1920s in order to document the landscape, as well as the plant and bird life. J.G. Wright, Superintendent of Eastern Arctic Patrol and National Film Board photographer, served on the 1945–1946 expedition sponsored by the Canadian National Institute for the Blind. As the Regional Director of Family Allowances for Yukon and the Northwest Territories, S.J. Bailey served as part of the Eastern Arctic Patrol beginning in the late 1940s. Indigenous and Northern Affairs Canada has offices in ten (10) regions, at headquarters and to deal with oil and gas leases. The offices are further divided into the broad divisions of treaties and aboriginal government; lands and economic development and education and social development. Northern Development is represented in only the Northwest Territories (NWT) and Nunavut (NU) regional offices and headquarters. The Nunavut Land Claims Agreement was implemented in 1993 between the Inuit of the Nunavut Settlement Area and the Government of Canada subject to the Constitution Act of 1982. The territory of Nunavut was formed in 1999. INAC has major responsibilities for managing the lands and resources of Nunavut. With respect to the Inuit of Nunavut, the department and its Minister have the challenge of implementing the Conciliator’s Final Report, dated March 1, 2006 on the Nunavut Land Claims Agreement Implementation Contract Negotiations for the Second Planning Period 2003-2013 "The Nunavut Project" authored by Thomas Berger. This report recommends an increase in Inuit participation in Nunavut's federal and territorial public service. By January 2012 there were two government audits that revealed that the federal government had earmarked about a billion dollars annually on constructing and/or maintaining First Nations infrastructure in First Nations communities. "Findings from the "AFN First Nations Regional Longitudinal Health Survey 2002/2003 study (March 2007) are notable: More than 1/5 of adult respondents report that they have no access to garbage collection services; Nine percent of homes do not have either sewage service or a septic tank; and Only 2/3 of respondents considered their water safe to drink: Over 60 percent of respondents obtain their drinking water from bottled water. To cite a 2003 INAC study, 39 percent of water systems exceeded one or more of the risk indicator thresholds occasionally or continuously. Among key informants, there was unanimous consensus that there is a clear infrastructure deficit on reserve and in the different categories, according to the community; investment needed in housing, school, water facilities, and roads were usually mentioned as examples." In 2005, the Office of the Auditor General of Canada "reported the lack of a legislative regime to ensure that water quality on reserves met the Guidelines for Canadian Drinking Water Quality, despite the existence of such a regime in every province and territory (OAG 2011 page 11)." The auditor general's report (2011-06) noted that INAC and Health Canada "do not ensure that drinking water is tested on a regular basis." "The National Assessment released in April 2011 was the result of "the most rigorous and comprehensive evaluation of water and wastewater systems on reserve ever under taken. Between July 2009 and spring 2011, independent engineers inspected 4000 on-reserve systems including 1,300 water and wastewater systems and more than 800 wells and 1,900 septic fields serving 571 First Nation communities." The National Assessment of Water and Wastewater Systems in First Nation Communities (2011) "found that 39 per cent of First Nations water systems were at high risk of being unsafe, affecting 25 per cent of people living on reserves. It said Ottawa would need $1.2 billion in repairs, better infrastructure and training to fix the problem, as well as an additional $4.7 billion over 10 years to keep pace with growing demand." 39% of the 807 water systems inspected were classified as high overall risk affecting 25 per cent of the on-reserve population base. The study found that "314 water systems were high risk, 161 water systems in 116 First Nation communities were under Health Canada Drinking-Water Advisories (DWA) as of February 2011. These DWAs may be impacting up to 18,900 people, which is approximately 3.9 percent of the total on-reserve population cited as 484,321 in the National Roll-up." Unikkausivut: Sharing Our Stories, an Inuit DVD boxset and website developed in collaboration with the Inuit Relations Secretariat of Aboriginal Affairs and Northern Development Canada. ^ "Public Accounts of Canada 2015 Volume II Section 15 - Indian Affairs and Northern Development Ministry summary". Government of Canada. 2015. Retrieved 19 Feb 2017. ^ "Civilization.ca-Gateway to Aboriginal Heritage-Culture". Canadian Museum of Civilization Corporation. Government of Canada. May 12, 2006. Archived from the original on 20 October 2009. Retrieved 2009-09-18. ^ "Inuit Circumpolar Council (Canada)-ICC Charter". Inuit Circumpolar Council > ICC Charter and By-laws > ICC Charter. 2007. Archived from the original on 2010-03-05. Retrieved 2009-09-18. ^ "In the Kawaskimhon Aboriginal Moot Court Factum of the Federal Crown Canada" (PDF). Faculty of Law. University of Manitoba. 2007. p. 2. Archived from the original (pdf) on 2009-11-19. Retrieved 2009-09-18. ^ Fife, Robert (August 28, 2017). "Indigenous Affairs department to be restructured in cabinet shuffle". The Globe & Mail. Retrieved August 28, 2017. ^ "Contact Us." Indian and Northern Affairs Canada. Retrieved on February 4, 2011. "Indian and Northern Affairs Canada Terrasses de la Chaudière 10 Wellington, North Tower Gatineau, Quebec." and "Indian and Northern Affairs Canada Room 2107 10 Wellington Street Gatineau, QC." Address in French: "Affaires indiennes et du Nord Canada Terrasses de la Chaudière 10, rue Wellington, Tour Nord Gatineau (Québec)." and "Affaires indiennes et du Nord Canada Pièce 2107 10, rue Wellington Gatineau, (QC)." ^ News, Nunatsiaq (2017-08-28). "Bye, bye INAC: Trudeau to split department into two pieces". Nunatsiaq News. Retrieved 2019-04-19. ^ Canada, Indigenous and Northern Affairs (2015-12-10). "Indigenous and Northern Affairs Canada". aem. Retrieved 2019-04-19. ^ Government of Canada. Department of Indian Affairs and Northern Development Act (R.S.C., 1985, c. I-6). Justice Canada: Laws. Retrieved on: 2013-10-30. ^ Treasury Board of Canada. Registry of Applied Titles. Federal Identity Program. Retrieved on: 2013-01-30. ^ Aboriginal Affairs and Northern Development Canada. . AANDC website. Retrieved on: 2013-01-30. ^ a b c "Terminology". Indian and Northern Affairs Canada. Archived from the original on 27 October 2009. Retrieved 2009-10-05. ^ a b c Heather Scoffield (January 5, 2012). "Oversight lacking for $1B in First Nations infrastructure funds: audit". ^ a b Implementation Evaluation of the First Nation Infrastructure Fund (Report). Aboriginal Affairs and Northern Development Canada. February 2010. ^ a b Office of the Auditor General of Canada. "Chapter 4: Programs for First Nations on Reserves". 2011 June Status Report of the Auditor General of Canada (PDF) (Report). Retrieved January 12, 2013. ^ National Assessment of Water and Wastewater Systems in First Nation Communities (PDF) (Report). Aboriginal Affairs and Northern Development Canada. May 2003. p. 27. ^ "Frequently Asked Questions - National Assessment of Water and Wastewater Systems in First Nation Communities: Release of Final Reports: National Assessment Results". Gatineau, Quebec: Aboriginal Affairs and Northern Development Canada. November 8, 2011. Retrieved February 9, 2013. ^ "Frequently Asked Questions - National Assessment of Water and Wastewater Systems in First Nation Communities: Fact Sheet". Gatineau, Quebec: Aboriginal Affairs and Northern Development Canada. July 2011. Retrieved February 9, 2013. ^ CBC (February 9, 2013). "Clean Running Water Still A Luxury On Many Native Reserves". Retrieved February 9, 2013. ^ "The Project". National Film Board of Canada website. Retrieved 2 January 2012. Lachlan Taylor Burwash's personal papers are held by the University of Toronto Archives and Record Management Services. This page was last edited on 19 April 2019, at 22:54 (UTC).